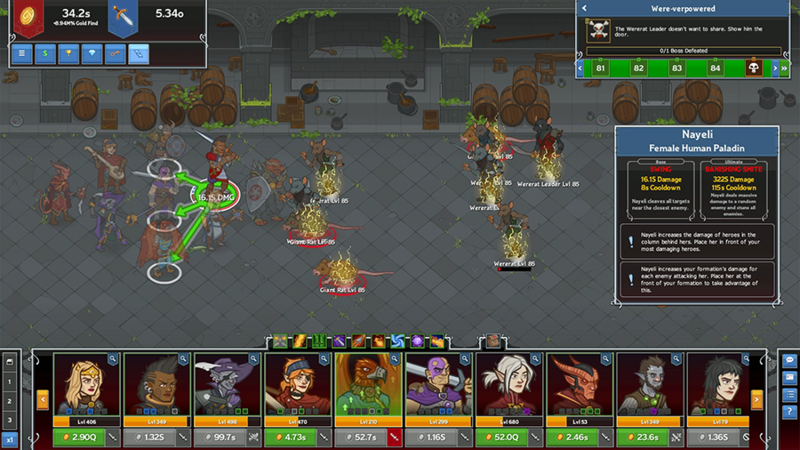 Tags: idle, champions, early, access, event, simril, dhadius, warden. A Simril Spoilsport has been pillaging the food stores around the outskirts of Luskan! We may be gearing up for the holidays, but the Champions have some work to do first: find and stop this festive food thief and make sure the Luskans have enough provisions for the long, cold Sword Coast winter. Simril 2 runs until Monday, December 17th at 12:00pm PST, introduces Warden, the Warforged Hexblade Warlock, and also brings back Dhadius the Scarlet, the Human Wizard! Forged to be the jailer for a prison filled with eldritch horrors in a faraway land, Warden became corrupted by the monstrosities they sought to keep locked away. Now they journey at the behest of an otherworldly master, seeking souls for the insatiable Dark Hunger to corrupt and feast upon. Warden is a DPS and Support Champion, corrupted by their Hexblade, the source of their otherworldly strength. At the same time, it is also from this Hexblade that the Elder Evils of Realmspace have laid their claim to Warden, infesting their body with eldritch malignancy. They use their Hex ability to curse enemies, debuffing them and causing them to take additional damage for each stack of the Hex curse they are afflicted with. 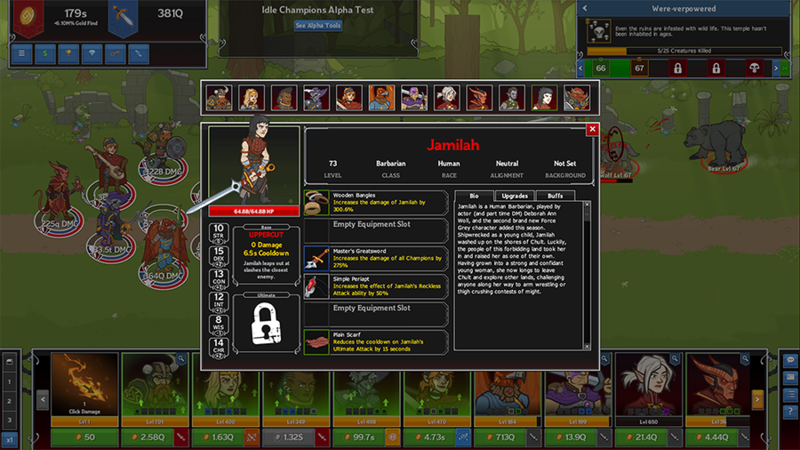 When you want to add Warden to your formation, you can swap them with Jamilah (Slot 11). 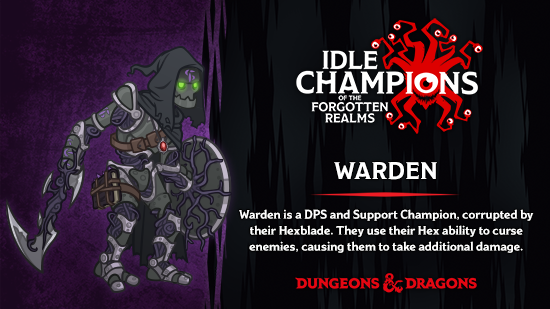 For more information about our latest Champion, check out the Idle Champion Spotlight: Warden dev blog! Dhadius is a mage of legendary status and acclaim (at least, in his own mind), who sees everyone else as intellectual worms. Being an egomaniac, he seeks out esoteric lore and rare magical secrets, so he may know things that the 'common fools' do not. 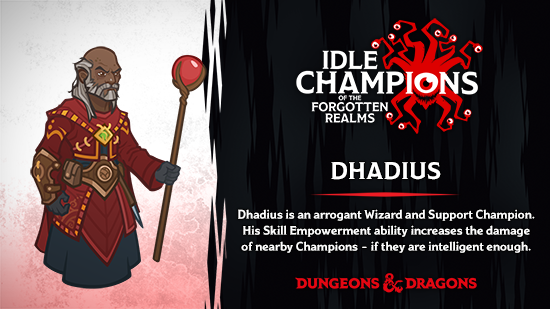 Dhadius hails from Luskan in the north, where he is a member of the Arcane Brotherhood, an infamous group of wizards. He joined them only recently and hasn't been taken as seriously by the others as he thinks he should be. He's determined to let it be known far and wide that he is a wizard to be respected and feared. Dhadius is an arrogant Wizard and Support Champion. His Skill Empowerment ability increases the damage of nearby Champions - if they are intelligent enough. When you want to add Dhadius to your formation, you can swap him with Calliope (Slot 5). Unlucky Hunters — Local beasts do not take kindly to the Champions trespassing upon their land. Beasts deal increased damage, and their hides are thickened like armor. Frostbitten — The thickness of the falling snow in outdoor areas increases as the adventure goes on. Champions on the outside of the formation deal less damage the further they go due to the cold weather. Unspeakable Horrors — Warden begins in your formation. Starting in the first area and continuing every 25 areas after, you lose a formation slot to creeping eldritch horrors. For each tentacle taking up a slot in the formation, Warden's damage is increased. Frightful Weather — In areas where it is snowing (excluding boss areas), the party takes damage every second. 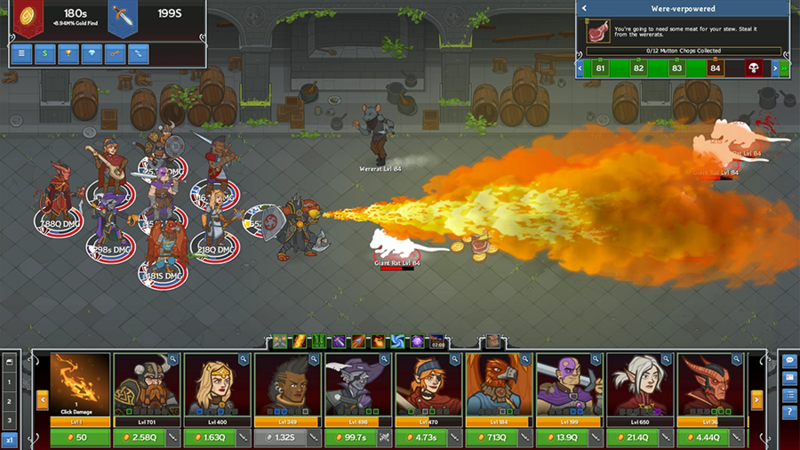 Light in the Darkness — Several slots in the formation are taken up by floating magical torches. A Wise Endeavour — Only champions with a wisdom score of 13 or higher – and of course, Dhadius – may be used. Tags: idle, champions, update, event, Simril, Warden, spotlight. During The Last War, House Cannith designed and constructed the ultimate prison: a vast underground complex built to entomb alien and extraplanar threats. Complete with its own Creation Forge and led by an immortal warforged named Warden, this complex was intended to keep these otherworldly threats imprisoned until the end of days. 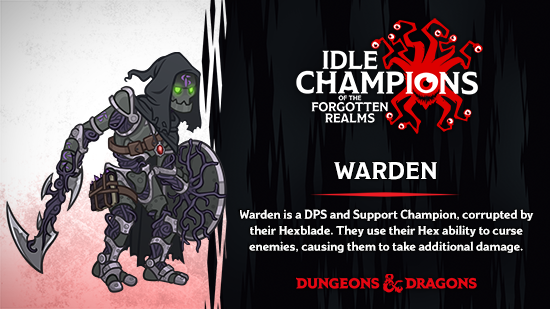 Welcome everyone to our Idle Champion Spotlight for Warden, our new Skirmisher Warforged Hexblade Warlock Champion for Simril Year Two! For more info, check out Warden's D&D Beyond Character Sheet! Believe it or not, the design for Warden actually began with a Triton Storm Sorcerer I called 'Solinus'. A non-named, non-lore character. Think Stoki: Krond: and Gromma. Let's make an awesome CNE hero. Should work with Krond. Re: Either be Evil or have Str +16. Keep in mind the story design doc: Adjacent champions are Vlahnya (bard), and Nerys (cleric). Cannot fit into slot 5 (Dhadius, the other event champion) or 6 (Krond, so they can work with them). I'll need first pass design done by Tuesday the 30th (of October). Focus on a mechanic that the players will like, but keep it simple. 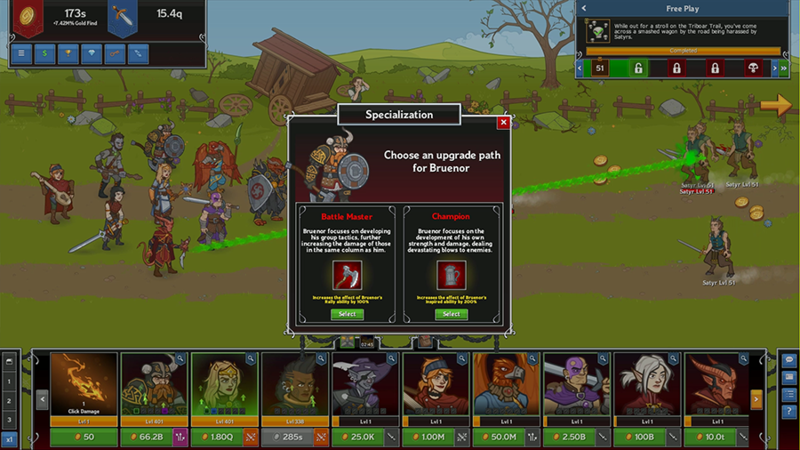 1-2 formation abilities, and Specializations that don't diverge as much as our other characters." Well, that put an end to Solinus! And being a Triton. But maybe a Storm Sorcerer could still work. I knew I wanted at least one ability that pulled ranged enemies to the front of the formation, and aside from that I just wanted to make sure that I was as close to D&D 5E as possible. To put it simply: I struggled. Storm Sorcerers are awesome, and I played around with the idea of using a cantrip like Lightning Lure to pull enemies to the front of the formation, and pretty much every other positional spell or ability that Sorcerers have access to. In the end, they all just felt wrong with a Warforged, perhaps because one of my recent characters, 0N1X, is a Tempest Domain Cleric and this felt too similar. It actually wasn't until I abandonned the idea of a Sorcerer that I was able to make some real progress. 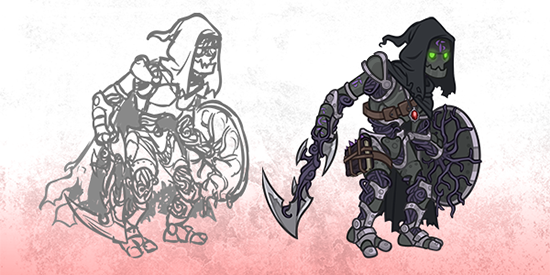 The initial design came together over the course of a few hours, and there was the basic idea: Warden, the Skirmisher Warforged Hexblade Warlock, was a DPS who would support the party by casting Hex on enemies, which could then spread to other enemies. He was perfect for Slot 9 (Makos)! Or so I thought. After putting the pieces together and doing the math, Justin and Chris elected to move Warden from Slot 9 to Slot 11 (Jamilah). Their reasoning was that they didn't want to have Warden compete with Makos for a spot with Krond, and that Warden's design was better-suited to Slot 11 where Jamilah and Strix have very limited capabilities as Support Champions. As a general character I had pictured a lean, warped Warforged decked out in an ominous but shabby cloak. Like the warforged version of an undead in terms of skeletal and spiky bits of metal and writhing with eldritch corruption. As you can tell, that's not a lot to go on - and Warden doesn't have any spikes. When Kat put together the first iteration of Warden, complete with spiky armor and more cloak, it just didn't work. It was missing something. We threw (probably too many) ideas at Kat, but what stuck was the core aspects of Warden's aesthetic: the organic components of the warforged body have been replaced by some kind of writhing eldritch tentacles, and Warden's magic items are now a part of their visual. We're pretty happy with the result! You can find more of Kat's art online at www.twitter.com/TehArtMonkey and www.instagram.com/TehArtMonkey. Check it out! As one might expect, Warden's basic attack is with their pact weapon, an Armblade made with their Hexblade. It is an artifact of profound otherworldly corruption that has now grown across and inside Warden's body. Now they are held together as much from these insidious tendrils as they are from the composite plating they were initially constructed with. Warden’s design revolves around Hex: cursing/debuffing enemies to make them weaker, and then attacking and killing them to spread Hex around further. Formation abilities unlock Hex, increase the number of attacks Warden is able to make (Thirsting Blade), and cause Hex to spread more quickly and easily (Master of Hexes). Finally, the final formation ability, Relentless Hex, allows Champions to deal even more additional damage to targets cursed by Hex by allowing the curse to stack(!). Hex — Warden casts a Hex curse on enemies before attacking them, debuffing them and causing them to take increased damage from all Champions. Thirsting Blade — Whenever Warden Attacks, they attack the same enemy twice. Master of Hexes — Enemies that die while afflicted with the Hex curse now spread it to all nearby enemies. Relentless Hex — Hex can stack up to four times on each enemy. Specializations for Warden go in one of two directions: further buffing their single target damage and adding a chance to stun (Eldritch Smite), or giving them a way to do extra AoE damage whenever they attack (Cloak of Flies). My personal favourite is Eldritch Smite because Warden's Hexblade transforms into a colossal Greataxe for the final attack, a bit of a subtle nod to Improved Pact Weapon as well as just being something really flavorful and awesome. Eldritch Smite — After Warden attacks an enemy, they attack the same enemy again an additional time with Eldritch Smite, dealing additional damage with a chance to stun the enemy. Cloak of Flies — Whenever Warden attacks, they do an additional AoE damage attack around them. Kat did a wonderful job of Warden's attack-into-Eldritch-Smite animation! Finally, Warden’s ultimate ability is Hunger of Hadar, where they open up a rift to the void at the front of the formation and a swarm of tentacles grasps all enemies, pulling them into a cluster and damaging and stunning them. Thematically it speaks to the otherworldly power that Warden accesses through their growing connection to the Elder Evils, but this spell is intended more to be pure utility: players have long wanted a way to grab ranged enemies and pull them to the front of the formation, and now they can! This ability was initially designed to be Arms of Hadar instead, but the scale of the effect we wanted to achieve was too large for that spell. Instead, we have somewhat combined both Arms of Hadar and Hunger of Hadar into one spell. I had a lot of fun putting Warden's equipment sheet together. 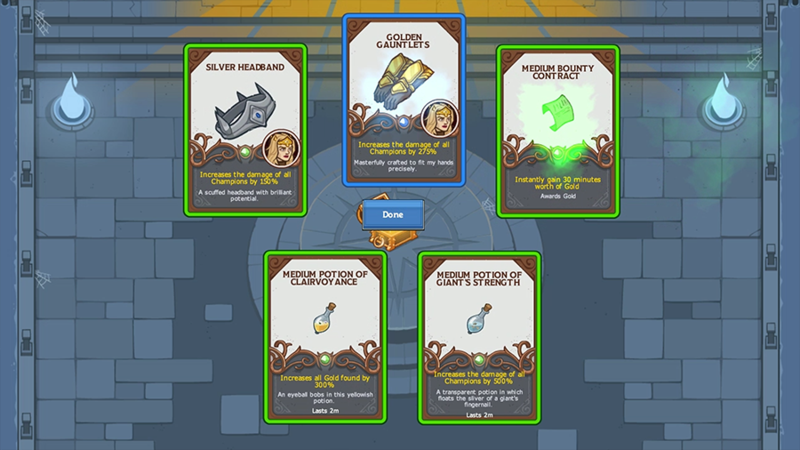 This time around, rather than having the more weathered or decrepit versions of different pieces of equipment at lower rarities, the grey/common and green/uncommon versions are now more pristine and new compared to higher rarities. 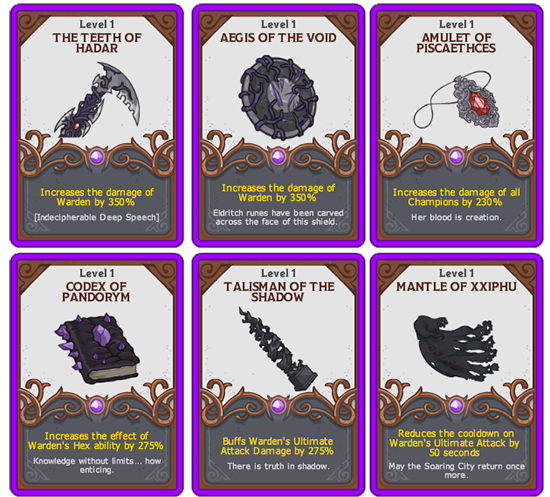 Now the rare/blue and epic/purple versions are the most vile and corrupt versions of each item. The item descriptions/flavor text owe a lot to the works of HP Lovecraft and Clive Barker, and of course, to Keith Baker and everyone else who has contributed to building the world of Eberron. So there you have it! From the not-really-that-deep depths of my mind, I pulled an incredibly-evil, Lovecraftian war robot for Idle Champions players to play with. The idea behind their final kit is that they can fulfill the role of a boss-killer with Eldritch Smite, attacking the boss multiple times and stunning them while stacking up Hex. I hope you enjoy Warden as much as I did making them! Feel free to send us feedback on via the Idle Champions Subreddit, Steam forum, or the Idle Champions Discord!